Recently I inherited a bag of old film cameras from my girlfriends Grandad – a treasure haul containing a rabble of cameras ranging from the 60’s to the early 90’s. Not long after I received the cameras my girlfriend’s sister was due to be married, their photographer Grandad sadly too ill to attend the wedding. So, as a sentimental gesture, I decided that I would do my best to resurrect one of the cameras and take a few photos for the bride on the day. 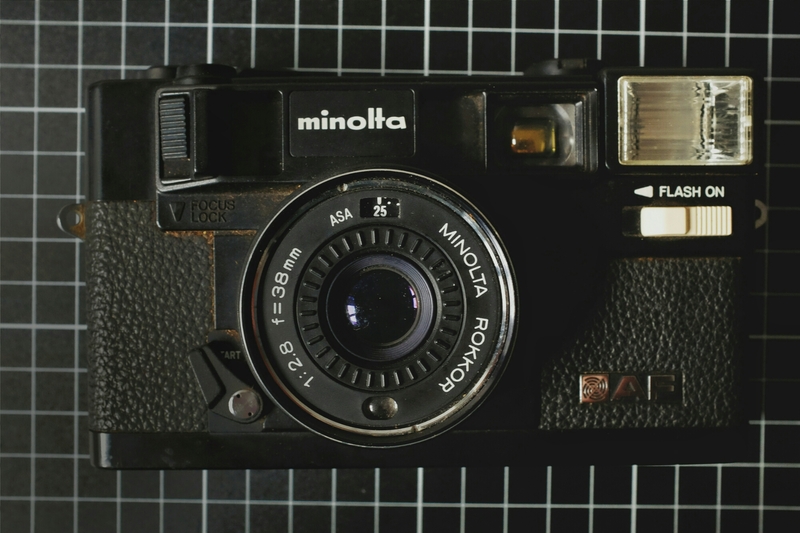 First I had to pick a camera – each in various stages of disrepair and neglect, showing the ageing effect of sitting in a dark and dingy corner for a a fair few years. I needed a fixer-up, one that still worked and looked like it could be restored to its former glory. 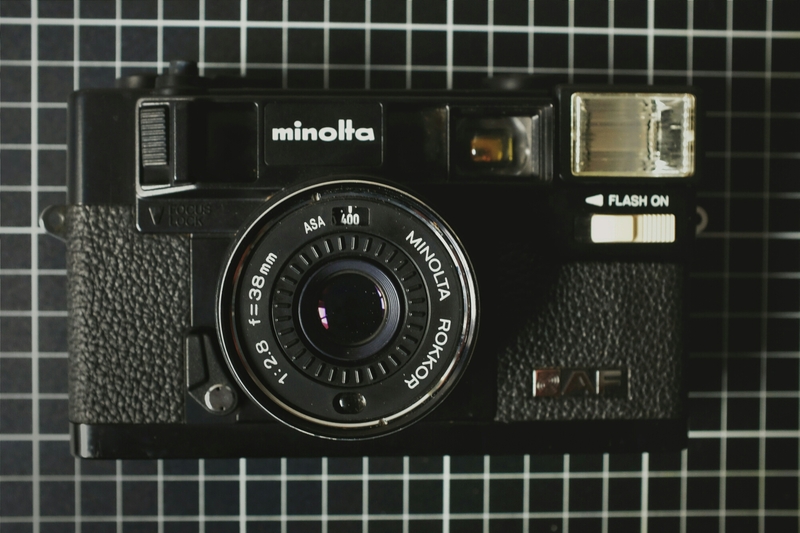 After a bit of deliberation I settled on a Minolata Himatic AF, hailing from 1979 – it even has his name and address on a sticker on the bottom! This was the first autofocus camera in the Himatic line, offering a 38 mm f2.8 lens and a flash to boot. It is the predecessor to the Himatic AF2, which has a bit of a cult following. I put a battery in and was happily greeted by some wiring and a light in the viewfinder – there was life in the old boy yet, he just needed a bit of TLC! After it was spick and span again, I thought it would be a good idea to run a film through it before the wedding – to give it a test run and work out how to use it. Here are a few shots from the camera, mostly snapped on walks around Brisbane city / near where I live. Taken on a roll of Kodak Tri-x. It’s a pretty simple beast, limited only by a few age-induced niggles. Exposure is automatic (as well as pretty accurate) and the camera will auto-focus on whatever is in the middle of the viewfinder. To select other parts of the frame as the primary focus point you are required to aim the central focus area at that point, press the shutter half way, press down the ‘focus lock’ switch you can see in the picture of the camera above, recompose your shot and then press the shutter button. A bit cumbersome and limiting when trying to grab that decisive moment. No pressing the shutter half way to lock locus – this came slightly later in the AF r(evolution). This is an amazing story with great results. lovely story and amazing photos! Great job !! Just incredible. Oh wow, this is amazing. A great read and even better pictures. Your work is wonderful! I need to show this to my wife. She would love to discover such a treasure trove of old cameras, and this post in particular is right up her alley. You’ve gained a new eager follower! Thanks so much for taking the time to look at so many of my posts! Sentimental creativity is the best inspiration. Nice to see its evolution in your story. This is super cool. Especially today when anyone can get “good enough” from their cell phone – film still has a magic that’s hard to beat.